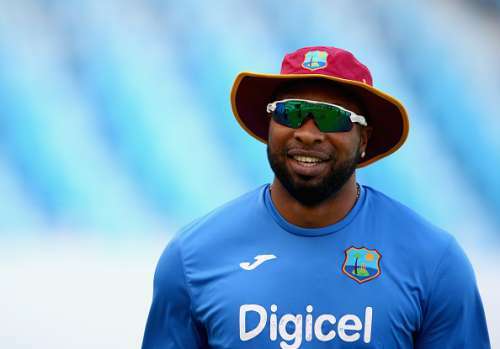 West Indian cricketer Kieron Pollard has established his reputation as one of the hardest hitters of the cricket ball at present and has also added value with his bowling. However, another exceptional quality that Pollard possesses is his ability to pull off stunning catches, particularly near the boundary ropes. Over the past few years, the big man has shown what an asset he can be on the field with his exploits in domestic T20 tournaments all over the world. Even in international cricket, the 29-year old has pouched some incredible catches for the West Indies, the most recent one coming in their ongoing series against Pakistan. Pakistan’s Babar Azam was batting on 120 when he hit Carlos Brathwaite for what looked like a sure-shot six. However, Pollard had other ideas as he jumped to catch the ball and then popped it in the air while he went over the fence. He then returned to the field of play to complete the catch, doing all of this in a matter of few seconds. The close-in catching positions in cricket, especially when spinners are operating, are designated mostly to players who are either short or of an average height. At 6 feet 6 inches tall, Kieron Pollard certainly doesn’t fall in any of these categories so for him to take a catch at silly point is something special. Playing for the Barbados Tridents in a match against the Jamaican Tallawahs during the 2015 Caribbean Premier League, Pollard picked up a brilliant low catch at silly point to send Mahela Jayawardene packing for a first-ball duck. As skipper of the Tridents side, the big West Indian positioned himself close to the batsman when left-arm spinner Robin Peterson came in to bowl. Jayawardene stepped forward to defend his first delivery towards the off-side but the ball stayed in the air long enough for Pollard to grab it and take off in celebration. IPL 2018: Is time running out for Mumbai Indians' superstar Kieron Pollard?